A clathrate is a chemical substance consisting of a lattice that traps or contains molecules. The word clathrate is derived from the Latin clatratus meaning with bars or a lattice. Traditionally, clathrate compounds are polymeric and completely envelop the guest molecule, but in modern usage clathrates also include host-guest complexes and inclusion compounds. According to IUPAC, clathrates are "Inclusion compounds in which the guest molecule is in a cage formed by the host molecule or by a lattice of host molecules." Structure of the 3:1 inclusion complex of urea and 1,6-dichlorohexane. The framework is composed of molecules of urea that are linked by hydrogen bonds, leaving approximately hexagonal channels into which align the molecules of the chlorocarbon. Color scheme: oxygen is red, nitrogen is blue, chlorine is green. Traditionally clathrate compounds refer to polymeric hosts containing molecular guests. More recently, the term refers to many molecular hosts, including calixarenes and cyclodextrins and even some inorganic polymers such as zeolites. The natural silica clathrate mineral, chibaite was recently described from Japan. Many clathrates are derived from organic hydrogen-bonded frameworks. These frameworks are prepared from molecules that "self-associate" by multiple hydrogen-bonding interactions. The most famous clathrates are methane clathrates where the hydrogen-bonded framework is contributed by water and the guest molecules are methane. Large amounts of methane naturally frozen in this form exist both in permafrost formations and under the ocean sea-bed. Other hydrogen-bonded networks are derived from hydroquinone, urea, and thiourea. A much studied host molecule is Dianin's compound. Space filling model of β-cyclodextrin, a host that forms clathrate complexes by inserting the guest into the "donut hole." Hofmann compounds are coordination polymers with the formula Ni(CN)4Ni(NH3)2. These materials crystallize with small aromatic guests (benzene, certain xylenes), and this selectivity has been exploited commercially for the separation of these hydrocarbons. Metal organic frameworks (MOFs) form clathrates. 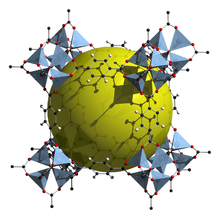 Example of Metal organic framework, MOF-5, the cavity for the guests is indicated by the yellow sphere. Photolytically-sensitive caged compounds have been examined as containers for releasing a drug or reagent. Clathrate hydrates were discovered in 1810 by Humphry Davy. Clathrates were studied by P. Pfeiffer in 1927 and in 1930, E. Hertel defined "molecular compounds" as substances decomposed into individual components following the mass action law in solution or gas state. In 1945, H. M. Powell analyzed the crystal structure of these compounds and named them clathrates. Inclusion compounds are often molecules, whereas clathrates are typically polymeric. Intercalation compounds are not 3-dimensional, unlike clathrate compounds. ↑ Hollingsworth, U.Werner-Zwanziger; Brown, J.D.Chaney; Huffman, K.D.M.Harris (1999). "Spring-Loading at the Molecular Level: Relaxation of Guest-Induced Strain in Channel Inclusion Compounds". J. Am. Chem. Soc. 121: 9732. doi:10.1021/ja9919534. ↑ Pearce, Fred (27 June 2009). "Ice on fire: The next fossil fuel". New Scientist. pp. 30–33. Retrieved 2009-07-05. ↑ Ellis-Davies, Graham C. R. (July 2007). "Caged compounds: photorelease technology for control of cellular chemistry and physiology". Nature Methods. 4 (8): 619–28. doi:10.1038/nmeth1072. PMID 17664946. ↑ Ellen Thomas (November 2004). "Clathrates: little known components of the global carbon cycle". Wesleyan University. Retrieved 13 December 2007. Wikimedia Commons has media related to Clathrates.